​The results from all project themes/activities will be integrated and a comprehensive final report will be produced in order to efficiently pass on important findings and recommendations to Management organisations and to WIOMSA through. 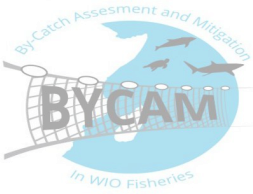 Calculating the extent, constitution and socio-economic worth of bycatch throughout the WIO taking into consideration any flaws in the reporting of bycatch . The determined processes and steps to undertake, and the financial and socio-economic implications in order to implement mitigation technologies. As such recommendations for improved governance and management be made available for each country involved in this project and any further countries who wish to provide data for this. ​Areas, species and gear types of particular importance in terms of bycatch will be identified which will be the basis for producing recommendations for those areas in most need of change. Thus to project will produce a priority fishing ground and gear type list for the WIO based on those fisheries in which implementation will have the greatest impacts. Contribution to other processes, databases (WIOFish, OBIS, AfreMas and IOTC) which support management measures in current management plans such as the small and medium pelagics management in Kenya and Tanzania. ​The Project will further contribute to the development of Management Plans for established and planned Marine Conservation Areas throughout the WIO.